I spent several hours tracking down an issue with the jQuery date picker control today and discovered a bit of a gotcha. I was displaying a simple table, with dynamically created editable rows that contained date controls. When the table was first created, the date picker in each row worked fine. But after hiding and updating the table the date pickers did not work. I thought initially that it was an issue with z-indexing and that the date picker was being displayed, just behind the dialog containing the table. Working on this assumption, I spent a while fighting with z-index settings in the jquery-ui css file as suggested in various online postings. The problem was that I wasn't deleting all the rows in my table and recreating, I was only updating a subset of rows and adding a few new ones. Thus I was calling the date picker function on an element that had already been enabled as a date picker. This prevented any elements from being made into date pickers. Moral of the story, never call datepicker() twice on the same element. Bad mojo. After played around with a couple of methods I settles on using the jQuery.context plug-in. It's a very nifty bit of code and relies on using a closure to capture the initial state. While this works great, I often find myself needing to pass some state information back along with the callback, typically when I am dealing with arrays of items (eg a column of buttons in a table that trigger click events). I'm using the same apply function as in the original code, but I'm copying over the argument list and appending the state object that was passed in along with the context. Copying over the arguments array is important, just appending the state to the arguments array causes funky results. I initially planned on allowing an array of arguments, but since its so easy to create a JSON style object on the fly as your state, it seemed more confusing than useful. Total script size: We are downloading source code, which can be quite large. Source code contains white space and comments, and is formatted to aid maintainability, not to produce svelte downloads. Number of Requests: Since there may be dependencies between the scripts (almost everything we use has some dependency on jQuery for instance), browsers will only download and evaluate one script at a time. Given the overhead in fetching and evaluating each script, this time can add up. Compression: Most moderns browsers support gzip compression. Using gzip can reduce the size of the scripts significantly. Concatenation: By combining all of your scripts into a single file, the client only needs to make one request. Order is still important, so you need to concatenate the scripts in the correct order of their dependencies. Remove whitespace: Tools like JSMIN and packer can remove whitespace and comments, greatly reducing the download size. Caching: By enabling caching for libraries and other scripts that are unlikely to change frequently, the browser will only download the script file once. My solution is based on a custom ASP.NET HttpHandler that allows web pages to include requests for scripts groups instead of just single scripts. The handler dynamically concatenates and minifies the script as well as emitting caching and gzip compression headers as appropriate. I define my script group mappings in the web.config inside a custom configuration section. I've seen a few folks online try to auto discover the scripts referenced by a page to avoid a configuration file, but I felt the overhead in terms of code wasn't worth the work. As you can see the caching and compression options apply to an entire script group while enabling and minifying can be controlled on a per script level. If you combine groups, the lowest caching interval applies to all included scripts. The configuration section is pretty simple. The configuration data is loaded up as an object by deserializing the contents of the config section. I really like using the .NET serialization, its possible to whip up a quick and nicely structured configuration file in just a few minutes. Plus, if the project scope expands, I can reuse the configuration objects with NHibernate persistence without significant code changes. The actual work of script optimization is done inside the ScriptOptimizerHttpHandler class. The entry point is the ProcessRequest method. First I load the configuration section, parse out my requested groups from the query string, and calculate some of the group-level settings if more than one group is requested. Next we emit our compression and caching headers. Finally we call the AppendScripts function to return each of the requested scripts. I am using a modified version of the JSMIN C# class provided by Douglas Crockford. My only modification was to rework some of the input and output functions to make it easier to interface with the library. You can choose any path you like, my choice was pretty arbitrary. 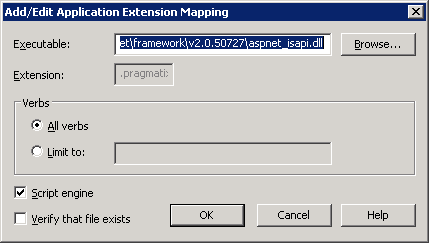 One thing to remember is that, while this will work fine in Visual Studio (using the built in Cassini debugger), it will fail in IIS 6 unless you register whatever path you chose to be handled by ASP.NET isapi dll. 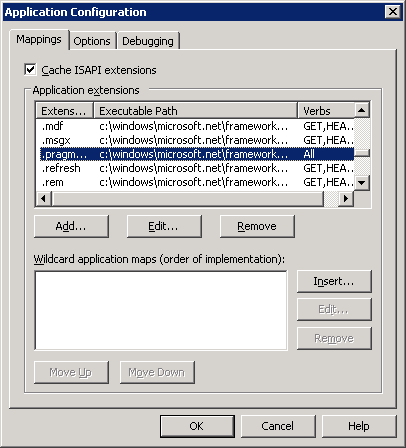 IIS 7 doesn't have this problem if you use integrated mode, since all extensions are routed through .NET. Once this is configured, define your script groups, add the references in your pages, and you should be good to go. This same technique could be applied to combine and compress css and possible html fragments if you load html dynamically in the client side. Eventually I plan to add a server control to replace the script reference tag, so that in debug mode I can return multiple script references for easier searching through code in Firebug. I would also like to do some server side caching of the resultant output, thus reducing the overhead of running JSMIN and reading all the file from disk. If you want to try this out for yourself, here is the source code. The .NET XML serialization libraries are a huge time saver for quickly implementing configuration files and small local data stores. All it takes is a few attribute markup tags to allow for quick saving and loading of an object graph to disk. One of the shortcomings of this approach is how .NET handles the serialization of subclasses. To illustrate this, lets take a quick look at a configuration file I developed for an data processing service I was working on recently. The service allowed the user to configure jobs that ran on a scheduled basis, performed configurable data searches against a remote database, transformed the data, and than ran the data through one or more output plug-ins. These plug-ins allowed perform a variety of different actions on the retrieved data. Each output plug-in needed different configuration object, since it did different things. The service architecture allowed us to write new plug-ins as needed to perform custom integration tasks for specific clients without needed to release a new version of the app. This list might contain several different output configuration types. Now, .NET will serialize this list of IOutputConfig objects to disk just fine, but on loading the configuration it will fail, since it doesn't know what classes to create for each saved XML output configuration element. There is a built-in mechanism to resolve this problem; using the XmlArrayItemAttribute you can specified all the subclasses that should be deserialized. Its messy and breaks encapsulation. We are leaking knowledge of the subclasses upwards, which is bad design. New implementations of outputs would have to modify the attribute in the library classes. Since we are implementing new functionality via plugin-ins (which are loaded dynamically), we don't know the full list of possible subclasses at compile time and thus can't list them in the attribute, even if we were willing to hold our noses and do so. We could also work around this by having our subclasses implement the IXmlSerializable interface, but this would require mucking about with XML readers and writers for every configuration type we implemented, which takes time and thus negates a lot of the benefits of this approach. The approach I used was to implement two custom classes, ISerializableList and ISerializableDictionary. These classes implement IXmlSerializable to wrap each of the subclasses in an tab. This tag records the type of the saved object so we know what type to feed an XmlSerialzer when restoring the data. One of the points to note is that I am stripping the assembly version info from the saved type name. This was to avoid version changes in the asembly causing load errors. For major schema changes I would need to implement another set of classes anyway, so as to be able to have both loaded at once for translation. Here is the full code for both classes and well as a link to a project you can use directly. This seems pretty natural and gives most of what I was looking for (code reuse and some variable hiding) without torturing the language too badly. I do occasionally need to call methods in the superclass from the subclass though. Douglas implements a relatively complex "sugar" that automatically provides reference to a "uber" object that mimics the "base" object in C#, but I was worried that this was a lot of extra code for something I really only do with a handful of functions. Complexity is bad. By saving the superclass function in the super var, it gets captured and is still around to be called, even though it is no longer references by the new object as a public function. Adding graphs to web pages used to require building up images server side or using a flash applet. Server side images had bandwidth concerns and limited interactivity while flash applets required a another skill set to develop. Interpolation of data. Data sets do not need to have a uniform collection of x-axis values. We take advantage of the excellent serialization provided by the Microsoft AJX.NET server side libraries to serialize this to the client. Using this method, we keep most of the heavy lifting of calculating the series data on the server side, where we can use C# code that has direct access to our data model. By adding items to the options object, we can get custom control over display elements like the formatting of the axis labels. By adding the code below to the options object, I can format a y-axis to display the server storage utilization in logical units of megabytes and gigabytes. 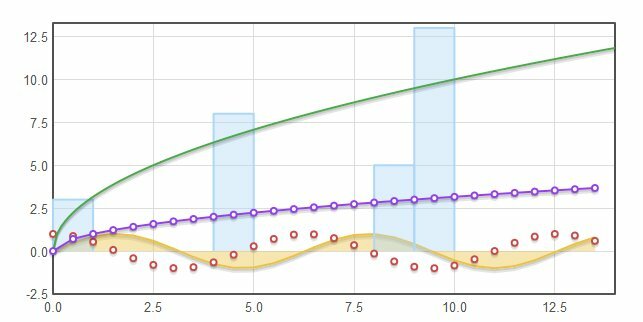 For our server storage plot, we can bind an event to the chart to display a tooltip style popup when a user hovers over a data point. This allows us to show the actual storage values without cluttering up the main graph. Here is the code to bind to the hover event. Another neat feature is the in depth control over the legend. By adding a legend object to our options definition, we can add arbitrary HTML markup to the legend. Here I use the legend markup to allow users to click on a machine in the legend to view another page with detailed machine data.